Chautauqua (“shi-TAW-kwa”) Institution is a rejuvenating retreat where its visitors treat summer as a verb. The experience is a hybrid of a college campus, a summer camp, a church revival, and a bygone era resort like Kellerman’s (a la Dirty Dancing). It’s likely to be unlike any place you’ve ever visited. 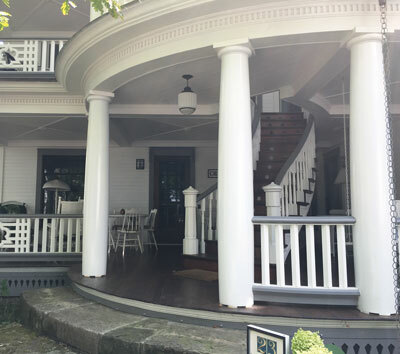 Situated on an idyllic 750 acres on the southwest tip of New York overlooking Lake Chautauqua, Chautauqua Institution is a gated community full of adorable Victorian cottages, inviting front porches, and absolutely no franchises. The porch of the Athenaeum Hotel at the Chautauqua Institution. An open-air Greek-style Hall of Philosophy and a Roman-esque amphitheatre host thousands for lectures, church services, and concerts. Summer visitors bustle around on golf carts, bicycles, or on foot, toting portable chairs and seat cushions to find a seat at the next upcoming event. 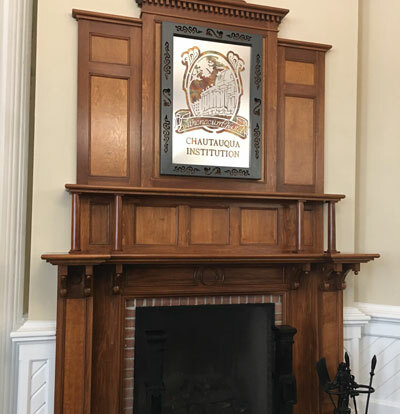 Almost 150 years ago, Chautauqua Institution began as a cultural and educational movement and teaching camp for Sunday school teachers. As a nonprofit education center, its offerings in education, religion, and the arts have expanded incrementally over the years. Entertainers and speakers who present at Chautauqua are typically contemporary and current in their respective fields and accomplished in their professions. Each summer season contains nine weeks of structured programming. Each week has its own unique, culturally aware theme, with corresponding events wrapped around those themes. Whether the theme is modern or historical, specific or general, all evoke thought and inspire considerate dialogue. For example, one of last summer’s most relatable themes was “Our Changing Relationship with Food.” Just about everything on campus related to various dimensions of the theme. Throughout the week in the town square, local farm-to-table eateries and wineries offered samples. On one special day, hipster food trucks occupied that same space. A view of the townsquare from the library balcany. The morning lectures in the amphitheatre drew noted author Ann Patchett and Chef Michael Ruhlman to hold a public conversation about food as a commodity and gender roles in the domestic kitchen. Chef Jacques Pepin spoke about cultural identity through sharing recipes and the legacy he will leave through teaching his daughter. Professors, active lobbyists, and food advocates spoke about food insecurity, food deserts, historic and modern diets across the socioeconomic spectrum, and fallacies in nutritional study data. The afternoon multi-denominational religious lectures in the Hall of Philosophy brought a Muslim speaker to talk about bonding through food, a rabbi to speak about food rules in the Torah, and a Catholic priest running a nonprofit whose mission is to rehabilitate ex-convicts by putting them to work running a bakery. These and other lectures highlighted myriad issues surrounding food, proving that something so bonding and comforting could also be a divisive topic. 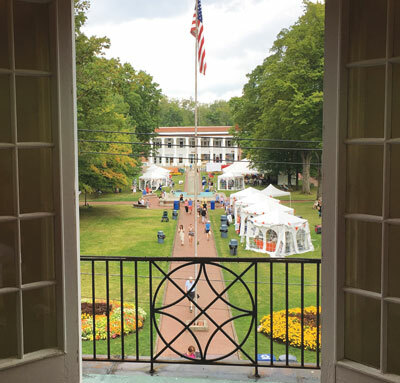 The policy at Chautauqua Institution is to welcome and respect all points of view, even those opposite to your own. The community is open to all religious beliefs and political persuasions, encouraging listening, polite idea exchange, and intelligent questions thoughtfully posed. A two-story cottage at Chautauqua Institution. Throughout the day, many opt for adult education classes, like the psychology of binge-eating or Egyptian farming. 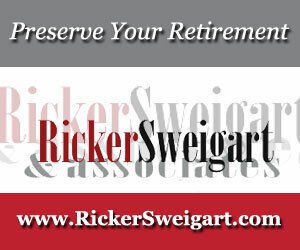 The more active pursuits are sailing, dancing, tennis, or golf lessons. Arts and crafts, such as glass fusing or pottery classes, prove to be popular, too. Intense, weeklong writing sessions, such as Mah-Jongg lessons or writing clinics, could also serve as a wonderful excuse to sit on the porch with other lifelong learners. All teachers must present impressive resumes and bring years of seasoning to the material they present. About those porches … One of the best activities at the end of a concentrated day of learning is rocking in a wicker chair on a wrap-around porch. Depending on where that porch is on campus, either scenery or people make a fine view. The Athenaeum, one of the hotel’s original lobby fireplaces. 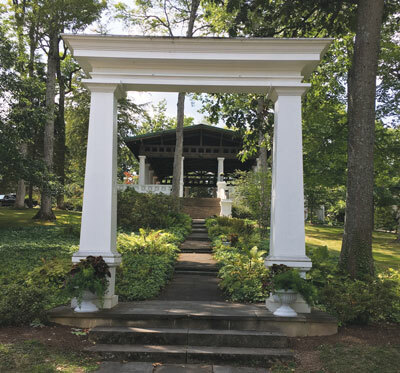 If the porch is situated just so, you may be able to glimpse a performance, the lake, or even an artist’s plein air painting. Evening entertainment offers a chance to take a breather from the intense programming of the day. Though not directly related to the theme, many of the performers have names that would impress your friends. Also on campus, resident companies held their ballet, opera, theater, and symphony performances. Though the entire year holds community events, no season is as structured and prolific as summer. If you’re planning to visit during the summer season, plan ahead. Cottage rentals can be pricey, and there is an additional fee to enter the grounds. 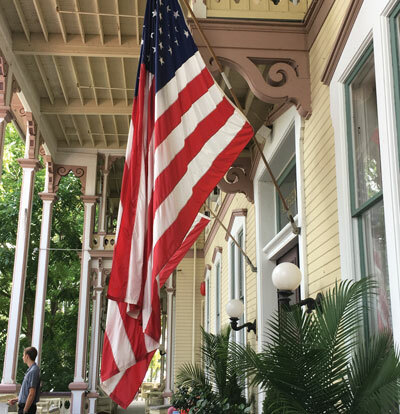 A historic hotel and quaint inns offer options, as do the 11 religious denominational houses. There is also dormitory-style lodging available during the last two weeks of the season when the college student workers leave their summer jobs and return to school. Chautauqua Institution is not far from the Finger Lakes, wine country, or Jamestown, New York, which is its closest train station. The closest airport is in Buffalo. Its rural setting and winding roads make a long country drive an ideal travel mode, about five to six hours from central Pennsylvania. The Hall of Philosophy at Chautauqua Institution. Few cars are permitted on campus. There is a small daily fee for parking off the grounds. Just inside the gate is a bicycle rental and repair shop. Shuttles run every half hour, and you can hitch a ride on a golf cart if you can catch one. 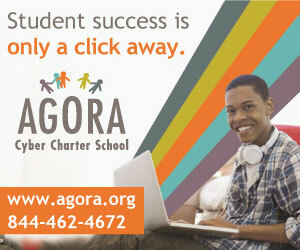 Admission to the gated community covers the lectures and concerts, religious events, and library use. There are additional charges for films at the cinema, resident artist performances, use of the fitness facilities, and lake activities. 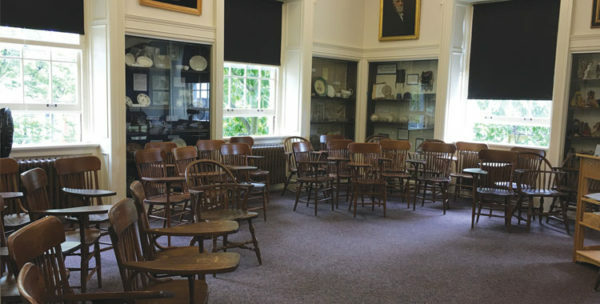 Photo caption, top: One of the classrooms at Chautauqua Institution.